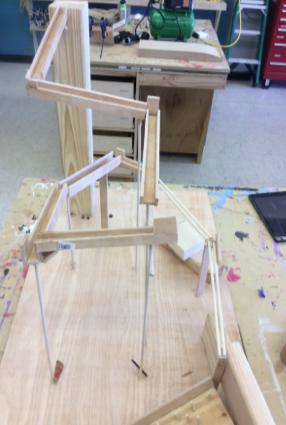 Fail to Succeed By Erin N.
On my last post I wrote about my maker project, the Marble Run , and it turned out better than I thought it would. We had originally planned for the wood to lead to a 3D printed portion of the tracks, and it didn’t really turn out that way. You may know that there are marble runs where the tracks are made out of filament connected by 3D printed “clip” type things, as seen in the picture to the right. If you look at the picture of our finished marble run, you can see that it’s not included. On the usual 3D printed marble run, the marble starts on the 3D part and ends there. With ours, it would had to have started on the wood and joined with it. First, we tried to hot glue the plastic like we had done with the wood and when that didn’t worked, we used tape. That didn’t look all that great and didn’t function as well as it needed to, so we disposed of it. Instead, we used two dowel rods next to each other to hold the marble together, which is also how the filament works. After that we reached the end of the road and one of our group members came up with the idea for a pin board idea. We built those, put it together, and it worked, the marble ran down the tracks. What happened to us is like what happens when you try a new trick on a skateboard- You may crash, but you get right back up again and try it a little differently till it works. The 3D pieces and filament didn’t work for us that well to complete our project, but we didn’t just fall into misery- we got right back up and found another way to succeed.